Mommy + Me: Valentine's Day! Mommy + Me: Valentine’s Day! I’ve already had quite a few people assume that I’m going to dress our little girl exactly like I dress myself, and let me tell you up front, they aren’t wrong! Of course she can pick out her own clothes once she gets interested in doing that, but until then, I guess I get free reign to choose. 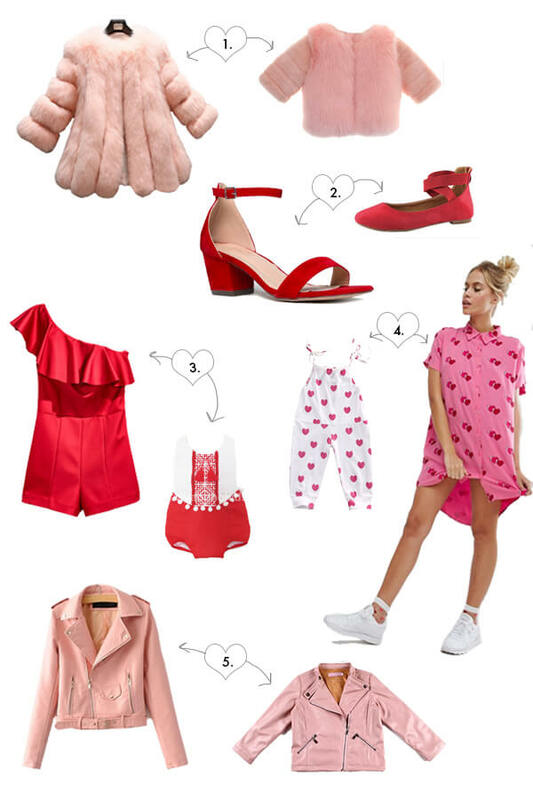 I saw a few things that would be cute for a Valentine’s Day outfit and I couldn’t help but check and see if there were any mini-me versions floating around and it turns out there are! The Nashville February weather so far has had a day in the 30’s and a day in the 60’s so I figured I could technically wear any of these options at some point this week. Can’t wait to have matching outfits that Bebe will (probably) be embarrassed of someday, but what’s the fun in parenting if you can’t do some things to amuse yourself as you go, right? Categories: Baby, Oh Baby | February 6, 2017 by thebandwifeblog. YOU’RE KILLING ME, SMALLS! Matching pink leather jackets?! Dying. It’s totally going to happen. FOR SURE! Cannot wait to see posts of you two in your matching outfits!